Much like the CandyBox, SuitestDrive is also a control unit made by Suitest. It is a desktop application which operates locally installed browsers, Android TV, Apple TV, Roku and Xbox One devices in your local network (see details below). Download SuitestDrive for Windows, MacOS or Linux (Ubuntu) from your profile page. Notice: SuitestDrive versions older than 1.2.0 are no longer supported and will not be automatically updated. If you are still using any of the old versions, please manually download the latest SuitestDrive from your profile page. For more information how to uninstall old version please check the FAQ. Android TV - devices with Android TV operating system, this includes many TV's and set-top boxes as well as the Amazon Fire TV. All Android TV based devices starting from version 5.0 are supported. Apple TV - devices with tvOS version 11.0 or higher, this includes Apple TV 4th generation and Apple TV 4K. Google Chrome browser installed locally. Currently version 66 and greater is supported. Microsoft Edge browser installed locally. Mozilla Firefox browser installed locally. Currently version 57 and greater is supported. This version of Firefox supports the HybridTvViewer for HbbTV app emulation. Roku - devices with system version of 7.5 or later. Vewd TV emulator - Chromium based Vewd TV Emulator standalone. Xbox One family - developer kits (OS version 10.0.15063 or higher) and retail versions (OS version 10.0.17134 or higher). To operate TV's and set-top boxes with an infrared port take a look at the CandyBox. Simply unzip the downloaded package into the directory of your choice and then run the executable file. SuitestDrive has a built in auto update function. To allow for automatic updates, Java must be installed on your machine. Important: Do not unzip the package into a location in which the path contains any special characters (# $ % & etc.) or diacritics. The path must contain only alphanumeric characters or underscores. On the first start-up SuitestDrive will ask to be paired with a Suitest organization. 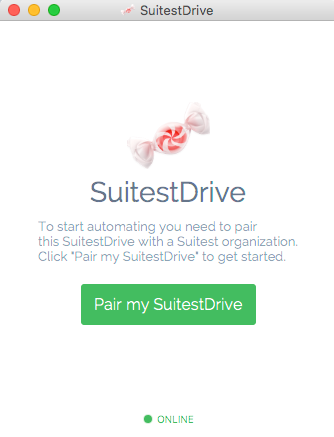 Press Pair my SuitestDrive to get to the pairing wizard screen, then enter a name for this SuitestDrive and select an organization where the devices operated by this SuitestDrive should appear. You can have many SuitestDrive apps paired with your Suitest organization. 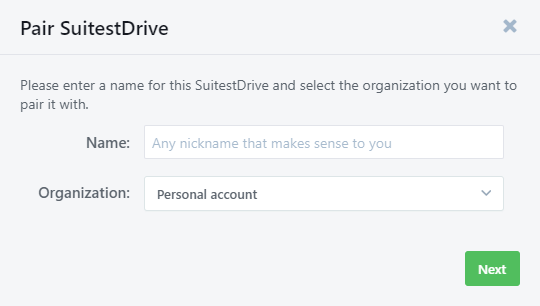 If you ever need to move your SuitestDrive to a different Suitest organization you have to delete it from the current organization first and then repeat the pairing process. You also have the option of sharing a device that is connected to your SuitestDrive, read more on sharing and access rights. Before using any device with SuitestDrive, make sure that the device works correctly without SuitestDrive. This is especially important for the emulators and browsers. Be sure to try to open an app in the emulator before attempting to add it to SuitestDrive. Different devices have a slightly different setup process, so we have written separate articles for browsers, Android TV device, Apple TV, Xbox One console and Roku. After set-up of the device has been completed, the device will be shown in your Suitest account. For the device to remain ready to use SuitestDrive must be running in the background. If one of the devices operated by this SuitestDrive shows up with status SUITESTDRIVE TURNED OFF then SuitestDrive is not running or the computer does not have a stable Internet connection. It is a good idea to add SuitestDrive to the list of your auto-start applications, so that your devices are available right after you boot the computer. If you intend to use the configured devices together with other people in your organization consider running SuitestDrive on a dedicated machine rather than on your personal computer. In the configuration file of SuitestDrive you can further customize the runtime environment for Chrome and Firefox. To access the configuration file select File -> Open config folder from the main menu. The folder will open in your system's file explorer. Look for a file called sd-config.yaml. Indents are important and made with the space character. User Agent - specify the user agent string of the browser. User profile - change the browser profile folder. Please note that all configuration options are commented out the first time you are accessing the configuration file. To make the option effective, un-comment the line (remove the leading # symbol). The sd-config.yaml file is commented throughout, for further information please read through the comments. In the configuration file you can change the serverStartTimeout for the Android TV and Apple TV SuitestDrive servers. This timeout may need to be changed due to the host machine being slow or overloaded which can cause test not to start because of the default 30 seconds timeout. Therefore if you commonly have test not start due to this timeout, simply increase it in the configuration file. # Increase the timeout in case when your test cannot start. In milliseconds. If you have no other configurations you can simply delete sd-config.yaml and then restart SuitestDrive. This will update the configuration file with the new configuration options for Android TV and Apple TV. Here are a few tips on how to resolve potential problems. SuitestDrive creates a temporary fresh browser profile every time it starts the browser. This is being done in order to invalidate any caches that may cause your test to break in deterministically. This however causes that all the plug-ins and browser extensions disappear every time you start the browser from SuitestDrive. Set a specific browser profile. Launch the browser through SuitestDrive and install plug-ins in that instance. For instructions on how to set a browser profile refer to the Configuration file section. SuitestDrive makes no attempt to alter the browser behavior to support specific Smart TV features. Therefore when launching Smart TV apps in Chrome or Firefox you should expect certain incompatibility issues. Consult with the app developer if and to what extent the app is intended to work in either browser. Also have a look at TV specific keys in browser article for information about key codes sent to your TV app during test execution. Please check the SuitestDrive troubleshooting section for guidance.